04:30:00 Makes 12 servings, 1 piece (118 g) each. Makes 12 servings, 1 piece (118 g) each. A buttery crumb crust is topped with saucy blueberries, a creamy lemon filling, whipped topping and fresh blueberries in this dessert recipe. 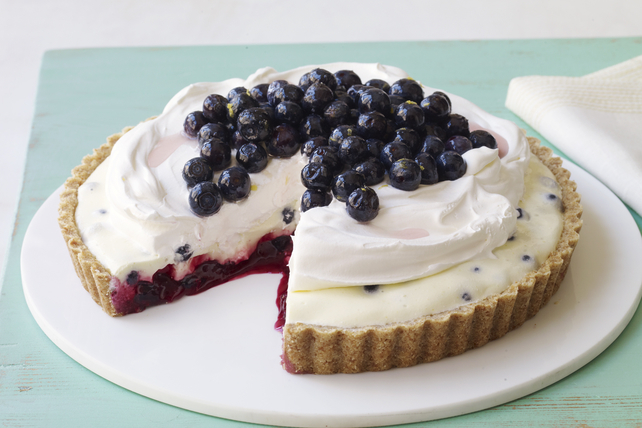 Our Layered Blueberry Tart is easy and delicious - what more could you ask for? Reserve 1 Tbsp. butter. Melt remaining butter; mix with wafer crumbs. Press onto bottom and up side of 9-inch tart pan with removable bottom. Bake 10 min. or until golden brown. Meanwhile, bring 1-1/2 cups blueberries, 1/2 cup sugar and 1 Tbsp. cold water to boil in saucepan, stirring constantly. Dissolve corn starch in 3 Tbsp. of the remaining cold water; whisk into blueberry mixture. Cook on low heat 2 min. or until thickened, stirring constantly. Remove from heat. Add reserved butter; stir until melted. Reserve 1/2 tsp. lemon zest and 1 tsp. juice; stir remaining zest and juice into blueberry mixture. Pour into crust. Add boiling water to jelly powder in large bowl; stir 2 min. until completely dissolved. Add enough ice to remaining cold water to measure 1 cup. Add to jelly powder; stir until slightly thickened. Whisk in 1 cup Cool Whip. Refrigerate 15 min. or until mixture is thick enough to mound. Stir in 1-1/2 cups of the remaining blueberries; spoon over layer in crust. Refrigerate 4 hours or until firm. Run knife around tart to loosen from rim of pan; remove rim. Top tart with remaining Cool Whip. Toss remaining blueberries with reserved lemon zest, juice and sugar; spoon over pie. Prepare using orange zest and juice. If you don't have a tart pan, use a foil-lined 9-inch round cake pan instead. Prepare tart as directed. Use foil handles to remove tart from pan before cutting to serve. Serving Size Makes 12 servings, 1 piece (118 g) each.